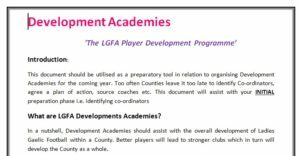 What are LGFA Development Academies? 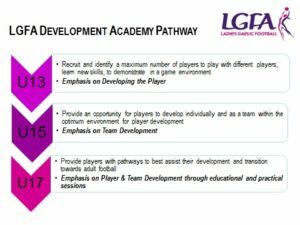 In a nutshell, Development Academies should assist with the overall development of Ladies Gaelic Football within a County. Better players will lead to stronger clubs which in turn will develop the County as a whole. How can our county organise development academies? The Ladies Gaelic Football Association has designed a step by step guide to get your development academies up and running. This includes key dates and information on the type of people you should identify for the role of coordinator or coach. The document is available for download below.